My latest commission is a thin, hollow-bodied electric guitar (which I've privately christened the "Chisholm Verithin"). It was ready for me in March 2014. This is Chisholm no. 46. I bought a DeArmond acoustic guitar pickup in the late 1960s and fitted it to my Epiphone Texan when I started playing in a band in pubs. I discovered the DeArmond in a drawer about a year ago and thought - why not build a guitar around this classic pickup? 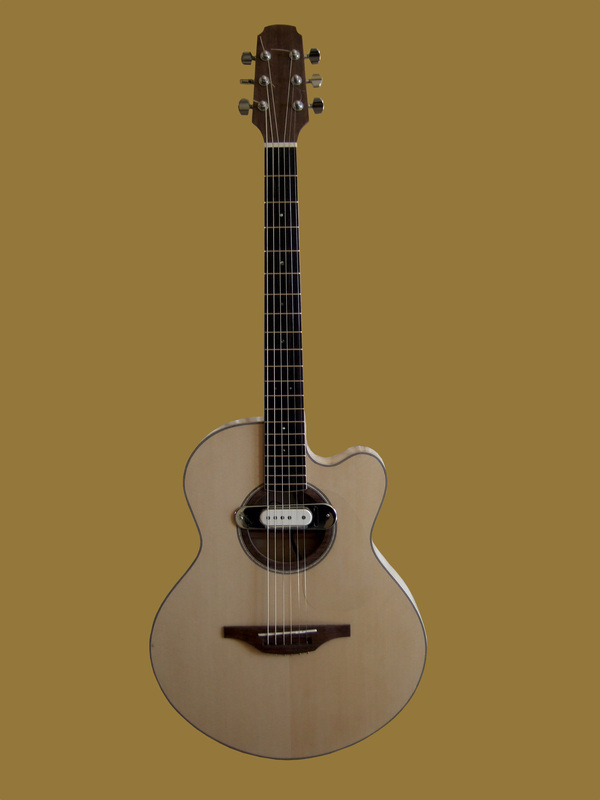 The body is a mid-jumbo single cutaway, with the DeArmond fixed across a conventional soundhole, and I specified a pegless, Lowden-style bridge - just for fun. Elixir Phosphor Bronze Nanoweb .010-.049 strings. The face is cedar and the back and sides are maple, with a mahogany neck. There's a rosewood bridge and the walnut ring around the soundhole is echoed by the walnut fascia on the headstock. The tuners are made by Gotoh.